How to Create an Email Subject Line to Get a Higher Open Rate? Some tips for an email subject to get a higher open rate. It is safe to say that the email subject is the your first chance to make a good impression. There are some things to consider when creating an email subject, the number of characters, the relevance of the subject to the email, words to use and the day to send the email campaign. First off, every email you send should have an email subject line. The email subject line should have an appropriate-length subject line (between 1-60 characters or 3-6 words), usually less means more. 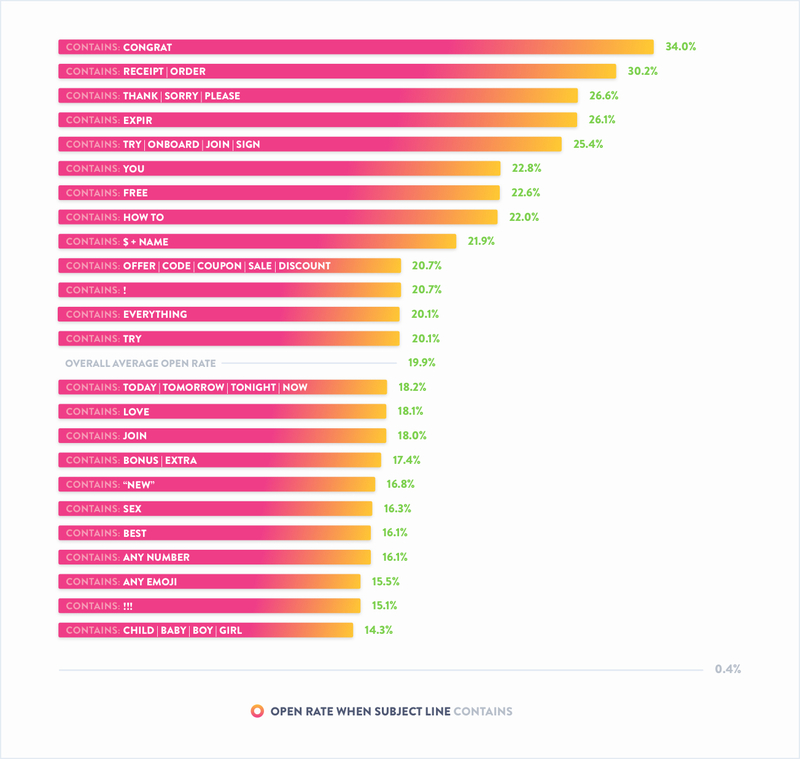 As shown in the image below, an average of 1-15 character email subject line has the highest open rate. It is safe to say that this would be the idea number of characters for an email subject line. Don't be vague: Always use keywords that mainly describes your email campaign. Ask questions: Asking a question in your email subject spurs curiosity to your audience. Just make sure your email answers the question you have in the email subject. Be creative: Try new exciting words to catch your recipients' attention. Be sure to still stick with your email content while being creative. Experiment: Test your email subject lines with your recipients. Some of the subject lines will work for some audiences and some won't. Here is an image of some words that work great such as: Congrat, Receipt/Order, Thank/Sorry/Please, etc. There are some words that are overused in the industry as well such as: New, Bonus, Child, any emojis, etc.. Take note of these words and try to avoid the ones that does not work for your audience. When to Send the Email? 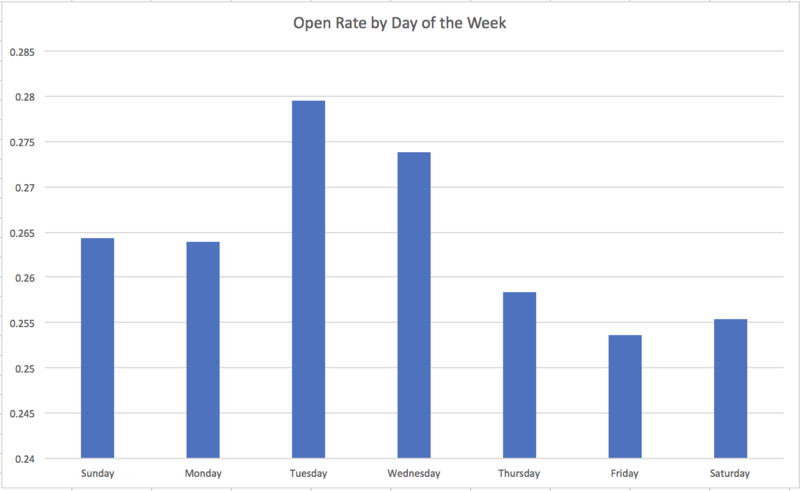 Usually in the middle of the week is a good time to send an email campaign. Middle of the week (Tuesday, Wednesday) is usually the time people are mostly caught up from their emails from the weekend and are able to look at other emails. 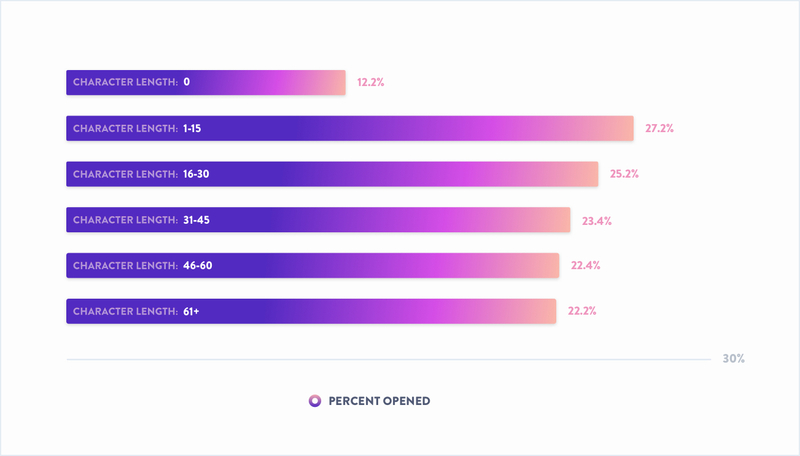 The above information is based on some market research articles (mixpanel, SendGrid) and our own experiences in sending email campaigns. All in all, make your subject lines short, to the point and test them out! Tip: Make sure you have a preview/preheader text as well. This is the secondary text beside the subject line when a recipient receives the email. Keep it short, include main points and buzzwords, and include a sense of urgency to catch the attention of your recipients more!